In case the answer you were looking for in this FAQ section is not available, you are invited to contact first your competent authority (here for EASA member states). For further assistance, you might submit your enquiry, together with the description of your authority’s position, here. Easy Access Rules for Continuing Airworthiness (Regulation (EU) No 1321/2014), covering covering Part-M, Part-145, Part-66, Part-147 and Part-T.
What is the EASA policy on Certificates of Release to Service for aircraft maintenance? What are the responsibilities of maintenance organisations and CAMOs associated to such maintenance? EASA policy on Certificates of Release to Service for aircraft maintenance and associated responsibilities of maintenance organisations and CAMOs, provides a comprehensive picture. What practice is accepted by EASA to release maintenance on aircraft not covered by the Basic Regulation? Various practices and the EASA’s position are described in the document Interpretation on "Maintenance release of aircraft not covered by the Basic Regulation". What is the difference between Commission Regulation (EU) No 1321/2014 of 26 November 2014 and Commission Regulation (EC) No 2042/2003 as amended? You can access the various lingual and format versions at: http://eur-lex.europa.eu/legal-content/EN/TXT/?qid=1421934905395&uri=CELEX:32014R1321 . Commission Regulation (EU) No 1321/2014 (recast) repeals Regulation (EC) 2042/2003 and its amendments. Its date of application is 20 days after 17/12/2014 (date of publication in the Official Journal). Article 6(3) of Regulation (EU) 1321/2014 introduces new provisions related to the minimum syllabus of certifying staff type rating training in the operational suitability data for the relevant type in accordance with Regulation (EU) No 748/2012, which further refers to Part-66 Appendix III points 1 (a)(ii) and (b)(ii). Some editorial corrections were introduced with no effect in its implementation. The existing approved AMCs/GMs covered by the EASA Decisions, which complemented (EC) 2042/2003 as amended , keep on being valid for newly published Commission Regulation (EU) 1321/2014. As regard to the approval of the continuing airworthiness organisations, what is the sharing of responsibilities between EASA and the EASA Member States? How to get a list of the EASA approved continuing airworthiness organisations? The management of all applications for organisations whose principal place of business is outside the territory of the EASA Member States (MS) for EASA Part-145 maintenance organisation approvals (MOA), EASA Part-147 maintenance training organisation approvals (MTOA), EASA Part-M Subpart G continuing airworthiness management organisation (CAMO) and EASA Part-M Subpart F approvals (Subpart F). Such organisations, generally nicknamed as “foreign” organisations, are managed by EASA in accordance with the relevant Annexes of Regulation (EU) No.1321/2014 and the associated EASA procedures. For more information, see Continuing-airworthiness-organisations where the lists of such “foreign” organisations are available as well as the fees and charges Regulations. The management of all applications for organisations whose principal place of business is inside the territory of the EASA Member States (MS) is performed by the competent authorities of these MS. Therefore, information about continuing airworthiness management organisations, maintenance organisations and maintenance training organisation which have principal place of business within any of the EASA MS is kept up-to-date by the competent authorities from these EASA MS. You may contact these authorities at http://easa.europa.eu/the-agency/member-states or consult their public websites when the MS accepted to publish these lists on a voluntary basis. Where can I find the continuing airworthiness requirements for third-country registered aircraft used by EU operator/owner? The aircraft is dry leased-in by an EU licenced air carrier, in which case Part-T (Annex Va) is applicable [see Article 3(5) of (EU) 1321/2014]. When third-country registered aircraft are not captured by above-mentioned cases, it is advised to go back to the foundation of the EASA system, namely the Basic Regulation (BR), Regulation (EU) 2018/1139. Reference should be made to Annex V (Essential requirements for air operations) in accordance with Article 29 for the aircraft described in Article 2(1)(b)(ii). Point 6 in Annex V of the BR describes air operations requirements related to continuing airworthiness, such as the requirement for release to service, pre-flight inspection, maintenance programme, records, … Being part of an Annex relevant to air operations, these requirements have to be overseen by the competent authority of the state of the operator. Furthermore, as required by point 8 of Annex V of the BR, for commercial air transport and other operations subject to a certification or declaration requirement performed with aeroplanes, helicopters or tilt rotor aircraft, the continuing airworthiness management and maintenance tasks shall be controlled by an organisation, whose obligations (such as establishment of a management system) are referred to in points 8.8 and 8.9 of Annex V.
(*) – The transfer of a state’s oversight responsibility is addressed in Article 83bis bis of Chicago Convention. When do I need a dual release on FAA Form 8130-3 under EU/US bilateral agreement? Under the terms of the EU/US bilateral agreement (BASA) (see here), a DUAL release is required for acceptance of USED engine/components from an US based repair station. NOTE: a single EASA release on Form 8130-3 with only “Other regulation specified in block 12” ticked in block 14a is also acceptable for USED engine/components. This is to cover the case where component maintenance includes the installation of a used (sub)component released on an EASA Form 1 with ‘single release’ only, and therefore where the assembly is not eligible for US-registered aircraft. CAUTION: DUAL release is not acceptable for ‘rebuilt’ engine/components because EASA recognises the term ‘rebuilt’ only as a manufacturing/production release (not a maintenance release) and only for engine. Can I import a rebuilt engine and associated components from US? Under the terms of the EU/US bilateral agreement (BASA) (see here), you can import an engine with a ‘rebuilt’ status in block 11, only when it has been released by the original engine manufacturer on a Form 8130-3 using the blocks 13a. to 13e. (left side). Please note that Form 8130-3 with ‘rebuilt’ status are not acceptable for components other than engine (regardless whether it has been released on left or right side) therefore the components accompanying the rebuilt engine should either be released REPAIRED/OVERHAULED… (right side) or NEW (left side). What does it mean ‘a release document issued by an organisation under the terms of a bilateral agreement signed by the European Community’ referred in AMC M.A.501(a)5(a)/AMC 145.A.42(a)1a)? Acceptance of NEW engine/components (and rebuilt engines) is governed by the Technical Implementation Procedure (TIP). The general principle is to accept such engine/components when released new on FAA Form 8130-3 using the blocks 13a to 13e (left side). Please refer to Section VII (from para 7.7 on) of the TIP for the detailed conditions under which this is acceptable. Acceptance of USED engine/components from an US based repair station is governed by the Maintenance Annex Guidance (MAG). The general principle is to accept such engine/components when subject to ‘dual release’ on FAA Form 8130-3 (except where the component is not eligible for U.S.-registered aircraft), using the blocks 14a to 14e (right side). Block 12 should include (or refer to) detailed information on the work performed, the associated approved data (e.g. ‘Overhauled in accordance with CMM 111, Section X, Rev 2, S/B 23 and FAA AD xyz complied with’) as well as the EASA Part-145 statement and approval number. Please refer to Appendix 1 of section B, paragraph 10 (Release and acceptance of components) of the MAG for the detailed conditions under which this is acceptable. What are the component release documents acceptable for installing such component (on aircraft or on a higher assembly) and releasing associated maintenance under EASA Part-145 regulation? The linked reference table provides a table summarising the component release documents (FAA Form 8130-3, TCCA Form One, ANAC Form F-100-01…) acceptable to an EASA Part-145 organisation, depending on where such organisation is located and from which regulatory system the component is coming. Twin turboprop aeroplanes of 5 700 kg MTOM and below can be exempted by the Member State from complying with any requirements applicable to CMPA and shall instead comply with the requirements applicable to other than CMPA. Continuing airworthiness shall be performed by a CAMO. Operator shall be CAMO approved (CAMO linked to the AOC). Continuing airworthiness management may be performed by the owner. CAMO is not required. Limited operations are defined in Regulation (EU) 1312/2014 Article 2(p). Can an independent certifying staff maintain ELA1 aircraft used for commercial operations (such as ATO)? No, ELA1 aircraft used for commercial operations cannot be maintained by independent certifying staff because in accordance with M.A.201(i) commercial operations require maintenance release by an organisation (part-M subpart-F or part-145 approved). Which are the correct statements to be written in block 11 of EASA Form 1 after maintenance? The meaning of “Inspected/Tested” status is inspected and/or, if applicable, tested as it described in provisions of part-M/part-145. Besides that, block 12 in the EASA Form 1 should contain the detailed information on the status/work described in block 11. Can a licenced pilot without a valid medical certificate perform pilot-owner maintenance? This question arises because of the different understandings of license validity in Commission Regulation (EU) No 1178/2011 (Aircrew) and No 1321/2014 (Continuing Airworthiness). In Reg. (EU) 1321/2014, the pilot-owner authorisation described in M.A.803 assumes that a pilot has sufficient technical knowledge to perform certain maintenance tasks. While exercising such pilot-owner authorisation, the pilot-owner even further develops his/her competency in maintenance. Hence, in the case where the medical examination has not been conducted or not been passed and the licence has therefore lost its validity, it is the intent of the rule to allow the pilot-owner to continue using this authorisation as long as he/she still considers himself/herself physically fit (including good visual acuity) and competent to carry out such maintenance (ref. point (a)(2) of Appendix VIII to Part-M). This is the reason why a new point (5) was introduced in AMC M.A.803 in 2016 (ED Decision 2016/011/R) stating: “not holding a valid medical examination does not invalidate the pilot licence (or equivalent) required for the purpose of the pilot-owner authorisation”. What are the responsibilities relevant to pre-flight inspection? As per the definition of ‘maintenance’ in article 2 point(h) of Commission Regulation (EU) 1321/2014, ‘pre-flight inspection’ (as defined in article 2(j)) is not considered maintenance. Therefore it does not require a certificate of release to service [M.A.201(d)]. What are the plans of EASA concerning the Continuing Airworthiness of aircraft operated under the new Part-DTO (Annex VIII to Reg. (EU) No 1178/2011 as amended)? Regulation (EU) No 1178/2011 was amended in July 2018 to introduce Part-DTO as regards to declared training organisations (ref. Reg. (EU) 2018/1119). This amendment of Aircrew Regulation requires also an amendment of Part-M, which has not been adopted to date but will be reflected in the next amendment of Reg. (EU) 1321/2014. The intent is to specify that commercial training organisations, whether ATO or DTO, will have the same Continuing Airworthiness obligations. NOTE: With adoption of Part-ML (Opinion 05/2016), CAMO* will not be required for organisations that operate Part-ML aircraft under Part-NCO. That means any DTO organisation operating Part-ML aircraft under Part-NCO will not be required to contract (or be approved as) a CAMO*. Can an airworthiness review certificate (ARC)/recommendation be issued after an airworthiness review with open findings? Neither an ARC nor a recommendation can be issued with open findings. Each finding requires a corrective action before the issue of the ARC or recommendation. The corrective action should be adequate to the open finding and it should be carried out and verified by the airworthiness review staff (ARS) before the issue of the ARC/ recommendation. Can an extension of an ARC be anticipated more than 30 days? As long as the conditions established for controlled environment (M.A.901 (b): continuously managed during the previous 12 months by a unique CAMO and maintained for the previous 12 months by part-145/part-M subpart F maintenance organisations or maintenance tasks referred to in point M.A.803(b) carried out and released to service by independent certifying staff (M.A.801(b)2) or pilot owner (M.A.801(b)3) are met, the validity of the ARC can be extended for a period of one year. Should the ARC extension be anticipated more than 30 days, you will lose the continuity of the airworthiness review pattern, being the next date of expiry one year after the date of extension. Can an Airworthiness Review Staff (ARS) perform an airworthiness review on an aircraft in which he/ she had released some maintenance as Certifying Staff (CS)? Such maintenance has been released as part of the airworthiness review’s physical survey of the aircraft (e.g. release necessary after visual inspections requiring panel opening). Note: cases 1 and 2 are justified by the fact that such specific maintenance activity is part of the AR and therefore does not require independence between maintenance and the AR. Such maintenance has been released as part of the annual inspection contained in the maintenance programme conducted together with the Airworthiness Review (for ELA1 aircraft not involved in commercial operations). Refer to M.A.901(l). From regulatory perspective, cases 1 and 2 are explicitly considered by AMC M.A.707(a) [2nd bullet of point (5)] for an ARS belonging to a CAMO also holding a AMO approval. Although not explicitly mentioned in any AMC, considering the note above, the Agency understands that this principle is also permitted in other cases where the ARS is also Certifying staff. Such cases include for example standalone ARS as per M.A.901(g) or ARS personnel of an AMO with 145.A.75(f) or M.A.615(e) privilege. Remark: iaw AMC M.A.710(b) and (c) points 1 and 2, when the ARS is not Certifying Staff, he/she must be assisted by a Certifying Staff to release the maintenance mentioned in cases 1 and 2. Can the airworthiness review certificate (ARC) of the large aircraft be extended during the extensive maintenance/long term storage? maintained for the previous 12 months by Part 145 organisations. there is no evidence or reason to believe that the aircraft is not airworthy, as stated in M.A.901(k). Thus, the procedure for the extension established in the CAMO has to address verification of the compliance with 3 above mentioned conditions. An aircraft going through the lengthy maintenance/modification or long-term storage is not considered to meet the condition number 2. CAMO 1 uses the anticipation when performing the airworthiness review or extension for 90 or 30 days correspondingly. After the issue or extension of the ARC, the aircraft is transferred during the anticipation period from CAMO 1 to CAMO 2. As the consequence CAMO 2 has solely continuously managed the aircraft for more than 12 months due to the term of the validity of the ARC accordingly being more than 12 month. Are the requirements of the M.A.901(b)(i) satisfied? The intent of the article M.A.901(b)(i) is to define the ‘controlled environment’ by indicating that the aircraft must be managed during last 12 months by unique CAMO, which indirectly refers to a standard term of validity of the ARC. Therefore, if the aircraft has been managed by more than one CAMO since the date of issue of the last ARC or the date of issue of the ARC extension, it actually indicates that controlled environment was discontinued. In addition in accordance with M.A.710(d) the 90 days anticipation shall be used to allow the physical review to be performed during a maintenance check. However, the intention of the rule was never to address the transfer of the aircraft within those 90 days with the purpose of avoiding the forthcoming airworthiness review. Concerning the 30 days anticipation for the ARC extension, point M.A.901(f) is intended for 2 consecutive extensions by the same CAMO managing the continuing airworthiness of the aircraft from the date of issue of the ARC, so the extended ARC could not be extended 2nd time by another organisation, because this constitutes a ‘breach’ of controlled environment. Is EASA Forms 1 required during the import of the aircraft in the EU? For the import of aircraft in the EU, the provisions of M.A.904 require the accomplishment of the airworthiness review, associated AMC M.A.904(a)(2) defines work to be performed in order to determine the airworthiness status of the aircraft. When performing the airworthiness review there would be certain provisions of part-M where it might be not possible to show the full compliance with M.A.710 e.g. availability of EASA Form 1 for all relevant components. In such case, other releases to service or serviceable tags may be acceptable for the competent authority of the importing country. Nevertheless, it must be ensured that the information required by M.A.305(d) related to the status of ADs, determination of remaining life, modifications and repairs is available (see also AMC M.A.305(d)). Is there any European requirement to maintain the back-to-birth traceability for any component fitted to an European aircraft? the records showing compliance with other requirements stated in M.A.305, e.g. an airworthiness directive, or any other information that could be affecting the configuration of the aircraft, must be retained too. What does the term “detailed maintenance records” mean? There has been a certain confusion about the understanding of “detailed maintenance records”, because this term is used in a different context for continuing airworthiness management and approved maintenance organisation (AMO). “Detailed maintenance records” as defined in M.A.614 or 145.A.55(c) are required to be kept by an AMO (respectively Part-M/F organisation or Part-145 organisation). Maintenance organisations are required to retain all detailed records in order to be able to demonstrate that they maintained aircraft and components in compliance with applicable requirements (see also remark). “Detailed maintenance records” as defined in M.A.305(h)(1) are those records, coming from the AMO1 having performed maintenance, required to be kept by the owner/operator (or the CAMO when required by M.A.201) allowing to determine the aircraft configuration, the airworthiness status of the aircraft and all components installed, as well as to plan future maintenance as required by the AMP, based on the last accomplishment. Consequently, the AMO should transmit to the owner/operator/CAMO a certain subset of the AMO maintenance records, including the certificates of release to service and repair/modification data related to the performed maintenance, so that the owner/operator/CAMO can demonstrate compliance with M.A.305. Not all AMO maintenance records need to be transferred from the AMO to the owner/operator unless they specifically contain information relevant to aircraft configuration/ status and future maintenance. Thus, incoming certificates of conformity, batch number references and individual task card sign-offs verified by and/or generated by the maintenance organisation are not required to be transferred to the owner/operator/CAMO. However, dimensional information contained in the task card sign-offs or work packages may need to be transferred and kept by the owner/ operator. It is to be noted that the record-retention period requirements are slightly different for the AMO and the CAMO. The AMO shall retain the records for 3 years, whereas the CAMO has to retain their records until they are superseded by new information (equivalent in scope and detail), but not less than 3 years. The starting point in both cases is when the aircraft or component maintenance has been released. Remark: It is considered a best practice as part of the AMO record-keeping system, (and it is also required by certain competent authorities) to record information (e.g. batch number or other tracking reference) relevant to the identification of all standard parts and material used during any maintenance. This practice may limit safety and industrial risks in the case where a batch is recalled by the manufacturer. Such record does not need to be transmitted to the owner/operator/CAMO. *: Transmitted records is a subset of AMO maintenance records provided to the CAMO. Certain transmitted records do not need to be kept as a record by the CAMO such as EASA Form 1 for a component with no scheduled maintenance task selected and not subject to AD or modification/repair. Must the EASA Form 1 be kept for on-condition components ? There is no specific requirement to retain the EASA Form 1 of such components unless needed to comply with the requirements set forth in M.A.305 (h)(1), (h)(4), (h)(5) and (h)(6) for determining the continuing airworthiness and configuration of the aircraft. What are the alleviations introduced by M.A.302(h) on the maintenance programme for General Aviation? In accordance with M.A.302(h), for ELA1 aircraft not involved in commercial operation, the owner, whether he has contracted a CAMO or not [see M.A.201(i)], has the option not to submit the Aircraft Maintenance Programme (AMP) to the competent authority for approval, but instead ‘declare’ an AMP, subject to compliance with the conditions described therein. In this respect, the owner may decide to deviate from the applicable scheduled maintenance recommendations (see also remark below) without the need to justify such deviation(s), but under his/her full responsibility. Such declared AMP does not need to be sent to the competent authority. In this scenario though, the declared AMP shall not be less restrictive than the ‘Minimum Inspection Programme’ (MIP) referred to in point M.A.302(i). A clear overview of the different options for the development (including the source of information and potential customisation) and approval of such an AMP is provided by ‘GM M.A.201(i), M.A.302(h) and M.A.901(l)’. In addition, such declared AMP shall be reviewed annually and this review can be done either by the person who performs the airworthiness review, during the accomplishment of the airworthiness review, or by a CAMO if contracted to manage the continuing airworthiness of the aircraft [see M.A.302(h)5]. Besides, if during the airworthiness review it is observed that there are discrepancies on the aircraft linked to deficiencies in the content of the maintenance programme, the competent authority shall be informed and the AMP amended. In accordance with M.A.302 and in particular M.A.302(h)(3), the AMP, declared or approved, shall in all cases include all the mandatory maintenance/continuing airworthiness requirements, such as repetitive Airworthiness Directives or the Airworthiness Limitation Section (ALS). In accordance with Part-M Appendix VIII point (b)(9), the tasks that are part of the annual or 100h check contained in the ‘Minimum Inspection Programme’ do not qualify for pilot-owner maintenance referred to in M.A.803. Please refer also to AMC M.A.302(e) (maintenance programme template), AMC M.A.302(h), GM M.A.302(h) and AMC M.A.302(i) (content of MIP). Please refer to Article 2 (point k) of Regulation (EU) 1321/2014 for the definition of ELA1. Please refer to Article 3 (point i) of Regulation (EU) 216/2008 for the definition of commercial operation. The agency also advises the owner who intends to transition from conventional to declared AMP to contact the competent authority for their guidance. When does the interval for the next calendar aircraft maintenance check/task or the calendar interval for the next component check/overhaul starts? The date of signing the certificate of release to service (CRS) should be considered the date of the accomplishment. The next due date should be calculated using this date. Case 1: The interval of the maintenance task has been ‘extended’ using a procedure included in the aircraft maintenance programme and approved by competent authority (refer to Appendix I to AMC M.A.302 point 4). Such procedure is often referred as permitted variation or ’tolerance’. In this case the next due date calculated using the original due date. Case 2: The maintenance task refers to a component maintenance task, for example the landing gear overhaul. In this case the start of the interval would be the date of the release to service after the overhaul of the landing gear or in some particular cases when specified in the maintenance data the interval may start from the date of installation. Case 3: The task is part of a maintenance check, where the duration of the check is significant compared to the interval of the task. For example, a check that lasts for 2 months and an inspection that has an interval of 3 months. In this case, it is reasonable to think that the performance of this task would need to be planned for the last days of the maintenance check, when possible. Otherwise, the inspection also can be done on the first day, but in that case, it is reasonable to expect that it will be released the same day (then the next due date would be 3 months after the CRS is signed). It also applies to the specific cases of mandatory tasks (ADs, CMRs, ALIs, etc.) defining repetitive action with a calendar limit. There are many other examples, the key is to use sound engineering judgment and the guidance provided in the Instructions for Continuing Airworthiness to calculate the next due date. When should I revise my Aircraft Maintenance Programme (AMP)? In accordance with M.A.302(g), the Aircraft Maintenance Programme (AMP) shall be subject to ‘periodic reviews’ and amended accordingly when necessary. Such a review allows to determine if an AMP revision is necessary to still comply with the obligations of M.A.302(d)(ii)/(iii) and ensure that the AMP continues to be valid in light of the operating experience. As a minimum, point (3) of AMC M.A.302 states it should be at least a 1-year review interval (annual review). When a revision of the ALS (Airworthiness Limitation Section) introduces a new or more restrictive task, EASA has the policy to issue an AD (Airworthiness Directive). Such an AD would typically mandate on one side the revised task accomplishment and on the other side the revision of the AMP itself, together with a compliance time for these two actions. However, in accordance with point (3) of AMC M.A.302, EASA recommends to review the AMP as soon as possible in this case to avoid a disconnection between accomplished maintenance task(s) and maintenance task(s) listed in the AMP. If the aircraft’s continuing airworthiness is being managed by a CAMO, the CAME (Continuing Airworthiness Management Exposition) should describe the AMP revision policy (including ‘periodic review’) under point 1.2 [Appendix V to AMC M.A.704]. Remark: In the case where the source documents are amended without having an effect on the AMP content, it is acceptable to use an indirect approval procedure (if granted by the competent authority in accordance with M.A.302(c)) to amend the relevant source document references in the AMP. Can a competent authority require the owner/ CAMO to include national requirements in the Aircraft Maintenance Programme (AMP), based on M.A.302(d)(i)? Although the Member State’s competent authorities are responsible for approving the AMP, the intention of the rule is that they should not impose aeronautical instructions (such as national requirements) in addition to the instructions for continuing airworthiness (ICA) issued by the design approval holder during the certification process with the Agency. The Agency is, on behalf of the Member States, the competent authority for initial airworthiness as per Article 77(1) of Regulation (EU) 2018/1139 (the EASA ‘Basic Regulation’). Following M.A.302(d)(ii), those ICA shall be the basis to develop an AMP. Nevertheless, competent authorities may issue alternate instructions to ICA when such instructions aim to offer flexibility to the operator [AMC M.A.302(d) point (2)]. Additionally, the mentioned AMC facilitates the rare case, where there have been no ICA issued by the design approval holder for a particular aircraft, modification, repair or STC (Supplemental Type Certificate): competent authorities may issue relevant instructions for the AMP in this case. The airworthiness (initial and continuing) of the aircraft referred to in Annex I to the Basic Regulation has to comply with the national rules of the state of registry, which may include ‘national requirements’. If the AMP is self-declared, based on the M.A.302(h) alleviation for ELA1 aircraft not involved in commercial operation, it cannot be initially challenged by the competent authority and the owner assumes full responsibility for its content (including potential deviations to ICA - see FAQ n.43423). There is no equivalent of US CFR Title 14 Part-43 Appendix E/Part-91 (§91.411) or Part-43 Appendix F/Part-91 (§91.413) in the EU system. How is it possible to escalate AMP task intervals? a) It should be ensured that the AMP continues to be valid in light of the operating experience [M.A.302(g) – see FAQ n.47406]. c) The AMP should include a procedure to manage the escalation of established intervals [AMC M.A.302 point (4) and point (2) of AMC M.B.301(c)]. - collection and analysis of in-service experience. ‘Appendix I to AMC M.A.302 and AMC M.B.301(b)’ provides detailed guidelines for the integration of this information into the AMP. d) If there is a CAMO involved, those points also have to be emphasised within the CAME, as specified in Appendix V to AMC M.A.704. 1.1 Escalation of mandatory tasks represents a change of the initial type design and therefore must be discussed and agreed between the DAH and the Agency*. 1.2 The AMP revision proposal and the information used to substantiate the escalation of non-mandatory tasks [AMC M.B.301(d)] have to be evaluated by the competent authority [AMC M.B.301(b) point (2)]. Following a positive evaluation, a direct approval of the AMP revision will be issued by the competent authority, as stated in M.A.302(d) point (iii). An indirect approval of the AMP through a CAMO is possible and described in more detail in FAQ n.19061. * Exception may exist under certain condition for Two Star CMR (Certification Maintenance Requirement) (see AMC 25-19). - In all cases, task de-escalation may need to be considered based on the supporting data [AMC M.A.302(f) point (4)]. - Escalation should not be confused with ‘permitted variations’ to AMP intervals, which applies to a unique aircraft for a unique occasion [‘Appendix I to AMC M.A.302 and AMC M.B.301(b)’ point (4)]. What kind of alternative (other than escalation) or additional instructions can be introduced in the AMP? For guidance on the escalation of AMP task intervals, please refer to FAQ no.48248. 1. De-escalation of task intervals (i.e. ‘more restrictive intervals’). Regardless of the source of the task, this may be eligible to indirect approval [see FAQ n.19061]. 2. Additional scheduled maintenance tasks selected by the operator on voluntary basis (e.g. operator policy for interiors), or manufacturer recommendations outside ICA (e.g. Service Letter) linked to product improvements or maintenance practices... Depending on their nature, those tasks may be added, changed and deleted through the indirect approval [see FAQ n.19061]. Remark: Additional and de-escalated tasks may originate from the reliability programme as indicated in point (4) of AMC M.A.302(f). 3. Concerning changes in task type (e.g. from General Visual Inspection to Detailed Inspection, or from Operational Check to Functional Check), by analogy with the escalation [see FAQ no.48248] EASA recommends that for safety-related tasks such changes are directly approved by the competent authority. For non-safety related tasks, the competent authority may accept an indirect approval. Finally, please be aware of the alleviations applicable for AMPs of ELA1 aircraft not involved in commercial operation, which are elaborated in FAQ n.43423. The quality manager is considered nominated personnel according M.A.706 (c). The minimum qualification and experience requirements are contained in AMC M.A.706. The nomination of the quality manager shall be performed using the EASA Form 4. Are deputy nominated persons required in CAMO? Neither M.A.706 (c) nor M.A.706 (d) contain a specific requirement for the identification of deputy “nominated persons” as in part-145 (145.A.30(b)(4)). So, in principle, we could say that there is no requirement for the nomination or identification of deputy “nominated persons”. Nevertheless, the CAMO needs to take into account the conditions for the continued validity of the approval contained in M.A.715, in particular point (a)(1) which refers to the continued validity of the approval provided the organisation remains in compliance with the requirements. The CAMO should ensure that they remain in compliance during the absence of the nominated persons, this could be by identifying in the CAME “one or several deputies” and the conditions under which the deputies will assume the responsibilities (this option could be acceptable for a short/medium absence). Another option would be to nominate another person. This would be necessary when the absence is going to be of considerable length and in this case the nomination and acceptance by the competent authority is done using the Form 4. Under which condition can a CAMO use the indirect approval procedure to amend AMP (Aircraft Maintenance Programme) task? - The aircraft managed by the CAMO is registered in the Member State ensuring the oversight of this CAMO (unless an agreement exists between the competent authority for the AMP and the competent authority of the CAMO). Do the maintenance contracts need to be submitted for the approval to the competent authorities after Commission Regulation (EU) 2015/1536 applies? M.A.708(c) requires the CAMO to establish a written maintenance contract for CMPA or aircraft used for CAT or commercial specialised operations or commercial ATO operations. The individual contracts need not to be submitted for approval to the competent authority. The competent authority shall approve the procedures for contracted maintenance as part of the CAME Part 3 and the basic information of the contracted maintenance should be included in a list of contracted maintenance organisations in the CAME part 5.4. The amendment to the list mentioned in 5.4 may be managed through the indirect approval procedure. Only for air carriers licenced in accordance with Regulation (EC) 1008/2008, the maintenance contracts need to be submitted to the competent authority as part of the package for initial application or for a change to the Air Operator Certificate as indicated in under M.B.701(a)(4). Does the CAMO quality system need to be subject to monitoring? Yes, the quality system is part of the activities of the CAMO and therefore it should be monitored. the continued compliance with requirement of part-M. The quality system procedures are considered to be within these approved procedures . This implies that quality system must be subject to audits and the CAMO audit programme/plan needs to reflect this. The way the quality system is going to be audited has to be described in the CAME and approved by the competent authority. Is Part-M applicable to approved Part-145 organisations? Yes, Part-M is applicable to Part-145 organisations. Article 3(2) of Regulation (EU) 1321/2014 states that organisations and personnel involved in maintenance of aircraft and components shall comply with Part-M. Nevertheless, not all the requirements of Part-M are relevant to Part-145 organisations. What does the term ‘occasional’ mean in 145.A.75(c)? Within the privilege described in 145.A.75(c) an aircraft maintenance organisation (AMO) may perform line maintenance activity in other-than-approved locations, provided it is considered as ‘occasional’. There is no formal definition of ‘occasional’ in the regulation, AMC and GM, but this privilege should be used to support an operator with which the AMO is already in contractual relation, when this operator needs line maintenance service for a short period at a new location due to a special occasion or particular reason (e.g. one-time flights, short term contracts/flight destination, flight schedule changes, special event at a particular location such as European athletics championship in Berlin, 6-12 August 2018, etc.). Subject to the approval by the Competent Authority, the maintenance organisation should develop in the MOE (e.g. Chapter 2.24 Reference to Specific Maintenance Procedures) the generic procedures to be followed in such a case: how to assess whether the maintenance can be performed, availability of tools/ equipment/ material/ components/ maintenance data, staff, adequacy of the facilities, environmental conditions, quality system, record keeping, need to report these cases to the competent authority, etc. In addition, the procedure should include the criteria (e.g. maximum service duration without gap in the continuity; limitation in the repetition of the need* at one given location) to classify the activity as ‘occasional line maintenance’. * In principle, the repetitive use of this privilege at the same location should not be considered, and for repetitive needs, an approved line station should normally be established at that location. Does the part-145 quality system need to be subject to monitoring? Yes, the quality system is part of the activities of the part-145 organisation and therefore it should be monitored. Point 145.A.65 (c) requires that the quality system monitors that the activities are being performed in accordance with the approved procedures. The quality system procedures are included within these approved procedures. This implies that quality system must be subject to audits and the part-145 organisation audit programme/plan needs to reflect this. Besides that the audits of the quality system shall satisfy the requirement of independent audits. This is further explained in AMC 145.A.65(c)(1) point 11: the independence of the audits should be established by always ensuring that audits are carried out by personnel not responsible for the functions, procedures or products being checked. So, the quality manager cannot audit the quality system in terms of independence of the audit. contract the independent audit element of the quality system to another organisation or a qualified competent person. The way the quality system is going to be audited has to be described in the MOE and approved by the competent authority. With respect to blend out repairs, is it required to record the depth and area dimensions of material removed during a blend out repair or is it sufficient to simply record that the damage has been repaired as per the SRM? Yes, the dimensions of the damage and the removed/remaining material should be recorded. This is a very important information in order to assess whether further damage (adjacent or at the same spot) at a later stage would be allowable or not. In addition, it is a safeguard measure in order to be able to determine, during audits, whether the person correctly determined that the damage was within limits. Can the subcontractor’s staff of a part-145 approved organisation issue an EASA Form 1? One of the fundamentals of subcontracting activities is that, during such maintenance, the part-145 has been temporarily extended to include the subcontractor. Subcontracting can be done only if the part-145 has approved procedures to do it (145.A.75 (b)) and the MOE is amendment to show this new subcontractor. The subcontractor’s staff (who does not need to hold a part-66 licence) must meet the authorisation criteria of the part-145 approved organisation, including the assessment of competence (knowledge, on-the-job performance and experience), continuation training and ongoing competency assessments. The certificate of release to service and the EASA Form 1 will always be issued under the maintenance organisation approval reference. The release of the aircraft maintenance carried out under A class rating has to be performed by certifying staff holding a Part-66 licence. Licencing of personnel has to follow Part-66 regulation. The release is either on the aircraft technical log or issuing an aircraft release to service statement. A Part-145 organisation holding an A approval rating on a particular aircraft type and having in its approved scope of work NDT inspections for this aircraft type. This organization needs to have part-66 certifying staff and NDT personnel qualified in accordance with 145.A.30(f). In this case the NDT inspector performs the NDT task and signs off the work order. The aircraft is released by appropriately qualified B1, B3 or C certifying staff under the organisation’s A rating. Please note that the release may include not only the NDT task but also the associated tasks (removal of panels, blankets, wires, re-installation, etc), or the NDT task may be part of a base maintenance check. The release of the engine maintenance carried out under B class rating has to be performed by engine’s certifying staff. The certifying staff is qualified following the procedures established by the organisation, Part-66 licence is not required. The release of works performed under class B is done on an EASA Form 1 (or by means of an internal release document when this component is for the organisation’s own use and the organisation has in place the related internal procedures in the MOE). A Part-145 organisation holding a B rating approval on a particular engine type and having in its approved scope of work NDT inspections for this engine type. This organization needs to have “engine” certifying staff (qualified in accordance with company procedures) and NDT personnel qualified in accordance with 145.A.30(f). In this case the NDT inspector performs the NDT task and signs off the work order. The engine certifying staff releases the works performed to the engine (including NDT inspection) on an EASA Form 1. The release of the component maintenance carried out under C class rating has to be performed by components certifying staff. The certifying staff is qualified following the procedures established by the organisation, no need to have a Part-66 licence. The release of works performed under class C is done on an EASA Form 1 (or by means of an internal release document when this component is for the organisation’s own use and the organisation has in place the related internal procedures in the MOE). A Part-145 organisation holding a C rating approval on a particular component and having in its approved scope of work NDT inspections for this component. This organization needs to have “component” certifying staff (qualified in accordance with company procedures) and NDT personnel qualified in accordance with 145.A.30(f). In this case the NDT inspector performs the NDT task and signs off the Work Order / Engineering Order. The component certifying staff releases the works performed to the component (including NDT inspection) on an EASA Form 1. The release of the maintenance carried out under D class rating has to be performed by “specialised services” certifying staff. The certifying staff is qualified following the procedures established by the organisation in compliance with EN4179, Part-66 licence is not required. The release of works performed under class D rating is done on an EASA Form 1 or using another form of release to service (other than aircraft release to service) as defined by the organisation in the MOE in compliance with 145.A.50 and approved by the competent authority. A Part-145 organisation holding an D approval on a particular NDT method. The approved scope of work will be NDT inspections on this method. This organisation needs to have NDT certifying staff qualified in accordance with 145.A.30(f). In this case the NDT certifying staff performs and releases the NDT task on an EASA Form 1 or using another form of release to service (other than aircraft release to service) as defined by the organisation in the MOE in compliance with 145.A.50 and approved by the competent authority. Shall the maintenance data be available and controlled at all times, even if there is no maintenance work going, or shall it be available only during the performance of maintenance? Maintenance data has direct influence on many processes of the AMO and contributes to demonstrate the overall capability of the organisation to perform maintenance. (b) regularly check that all amendments are being received, e.g. by subscribing to a document amendment scheme (sufficient in case of direct access to the maintenance data through the DAH/OEM. The subscription to the maintenance data distribution system of the customer/operator is insufficient, additional independent verifications through the original author shall be done). When the maintenance data is arranged directly by the AMO it shall be available and controlled continuously. There are certain situations when the maintenance data can be obtained only through the customer/operator. One of the examples would be the maintenance data for the large aircraft. The maintenance data coming from the TC holder is usually customised because of the model/configuration/modification/order of aircraft, so it is normally not possible for the AMO to have this customised maintenance data directly from TC holder without having an aircraft of that type under the contract. When the maintenance data is provided by the customer/operator, it shall be held and controlled by the AMO during maintenance on the concerned aircraft/component. Whenever the maintenance data is not available or not current, the maintenance shall not be performed and released, as mentioned by 145.A.50(a) and 145.A.80 of the Regulation 1321/2014 correspondingly. Remark: Manuals issued by the (S)TC (Supplementary Type Certificate) holder such as AMM and CMM do not need to be stored as a record. Recording the revision status of such manual may be sufficient [AMC 145.A.55(c)]. to demonstrate that the organisation worked in compliance with their respective requirements. Are the changes imposed by the EU Regulation 1149/2011 applicable to the Certifying staff qualified in accordance with Appendix IV to part-145? The provisions of the paragraph 6 of the Article 6 of the Commission Regulation (EU) No 1321/2014 which were introduced by the Commission Regulation (EU) No 1149/2011 relating to the 10 years limit for obtaining the basic training/experience and 3 years requirement referred to in part-66 Appendix III para 1(a)(iv) relating to the type rating endorsement in part-66 Licence are not applicable to Certifying staff qualified in accordance with Appendix IV. The practical type training is required in accordance with para 1 (e) of the Appendix IV to part-145, because in accordance with changes imposed by the Commission Regulation (EU) No 1149/2011, the type training shall consist of the theoretical training and examination and practical training and assessment, as stated by item 1 of Appendix III to part-66. On job training required by 66.45(c) is not applicable to the Certifying staff qualified in accordance with Appendix IV. Can a certification maintenance requirement (CMR) be performed by the Flight Crew before flight? The aircraft is away from a supported location. Sufficient practical training has been carried out. There is a procedure in the Maintenance Organisation Exposition. As a consequence, the competent authority should assess that the test is simple and that all the other conditions mentioned in 145.A.30(j)(4) and associated AMC/GMs are met. What is the meaning of the Protected Rights in the Appendix IV to Part-145? The protected rights mentioned in paragraph 2(a) of the Appendix IV to Part-145 were included in the Regulation 2042/2003 for the persons who were already working in a Part-145 organisation in a location situated outside the EU before the entry into force of Part-66. These protected rights allowed those persons to continue exercising (inside that particular Part-145 organisation) the privileges of the certification authorisation issued by that Part-145 organisation without the need to comply with paragraphs 1(c) to 1(f). If this person changed the employment to a different Part-145 approved organisation after the entry into force of Part-66 (i.e. 28 November 2003), the previous certification authorisation is not valid and he/she needs to receive a new one from the new Part-145 approved organisation. In this case paragraph 2 of Appendix IV is not applicable anymore. This implies that any new or extended authorisation granted by AMOs to their C/S after the entry into force of Part-66 must comply with paragraphs 1(c) to 1(f) in particular regarding the type training certificates. What are the training requirements for personnel within a Part-145 organisation, other than those contained in Part-66? The accountable manager shall demonstrate a basic understanding of Part-145. The organisation shall establish and control the competence of personnel involved in any maintenance, management and/or quality audits in accordance with a procedure and to a standard agreed by the competent authority. In addition to the necessary expertise related to the job function, competence must include an understanding of the application of human factors and human performance issues appropriate to that person's function in the organisation. Fuel Tank Safety training (Appendix IV to AMC 145.A.30(e) and 145.B.10(3)). Appendix IV to AMC 145.A.30(e) and 145.B.10(3). The organisation shall ensure that personnel who carry out and/or control a continued airworthiness non-destructive test of aircraft structures and/or components are appropriately qualified for the particular non-destructive test in accordance with the European or equivalent Standard recognised by the Agency. Personnel who carry out any other specialised task shall be appropriately qualified in accordance with officially recognised Standards. By derogation to this paragraph those personnel specified in paragraphs (g) and (h)(1) and (h)(2), qualified in category B1 or B3 in accordance with Annex III (Part-66) may carry out and/or control colour contrast dye penetrant tests. 1. For organisation facilities located outside the Community territory certifying staff may be qualified in accordance with the national aviation regulations of the State in which the organisation facility is registered subject to the conditions specified in Appendix IV to this Part. 2. For line maintenance carried out at a line station of an organisation which is located outside the Community territory, the certifying staff may be qualified in accordance with the national aviation regulations of the State in which the line station is based, subject to the conditions specified in Appendix IV to this Part. 3. For a repetitive pre-flight airworthiness directive which specifically states that the flight crew may carry out such airworthiness directive, the organisation may issue a limited certification authorisation to the aircraft commander and/or the flight engineer on the basis of the flight crew licence held. However, the organisation shall ensure that sufficient practical training has been carried out to ensure that such aircraft commander or flight engineer can accomplish the airworthiness directive to the required standard. 4. In the case of aircraft operating away from a supported location the organisation may issue a limited certification authorisation to the commander and/or the flight engineer on the basis of the flight crew licence held subject to being satisfied that sufficient practical training has been carried out to ensure that the commander or flight engineer can accomplish the specified task to the required standard. The provisions of this paragraph shall be detailed in an exposition procedure. (ii) to any person with not less than five years maintenance experience and holding a valid ICAO aircraft maintenance licence rated for the aircraft type requiring certification provided there is no organisation appropriately approved under this Part at that location and the contracted organisation obtains and holds on file evidence of the experience and the licence of that person. All such cases as specified in this subparagraph shall be reported to the competent authority within seven days of the issuance of such certification authorisation. The organisation issuing the one-off authorisation shall ensure that any such maintenance that could affect flight safety is re-checked by an appropriately approved organisation. In addition to the appropriate requirements of 145.A.30(g) and (h), the organisation shall ensure that certifying staff and support staff have an adequate understanding of the relevant aircraft and/or components to be maintained together with the associated organisation procedures. In the case of certifying staff, this shall be accomplished before the issue or re-issue of the certification authorisation. The organisation shall ensure that all certifying staff and support staff are involved in at least six months of actual relevant aircraft or component maintenance experience in any consecutive two year period. The organisation shall ensure that all certifying staff and support staff receive sufficient continuation training in each two year period to ensure that such staff have up-to-date knowledge of relevant technology, organisation procedures and human factor issues. The organisation shall establish a programme for continuation training for certifying staff and support staff, including a procedure to ensure compliance with the relevant paragraphs of 145.A.35 as the basis for issuing certification authorisations under this Part to certifying staff, and a procedure to ensure compliance with Part 66. Except where any of the unforeseen cases of 145.A.30(j)(5) apply, the organisation shall assess all prospective certifying staff for their competence, qualification and capability to carry out their intended certifying duties in accordance with a procedure as specified in the exposition prior to the issue or re-issue of a certification authorisation under this Part. The holder of a category A aircraft maintenance licence may only exercise certification privileges on a specific aircraft type following the satisfactory completion of the relevant category A aircraft task training carried out by an organisation appropriately approved in accordance with Annex II (Part-145) or Annex IV (Part-147). This training shall include practical hands on training and theoretical training as appropriate for each task authorised. Satisfactory completion of training shall be demonstrated by an examination or by workplace assessment carried out by the organisation. 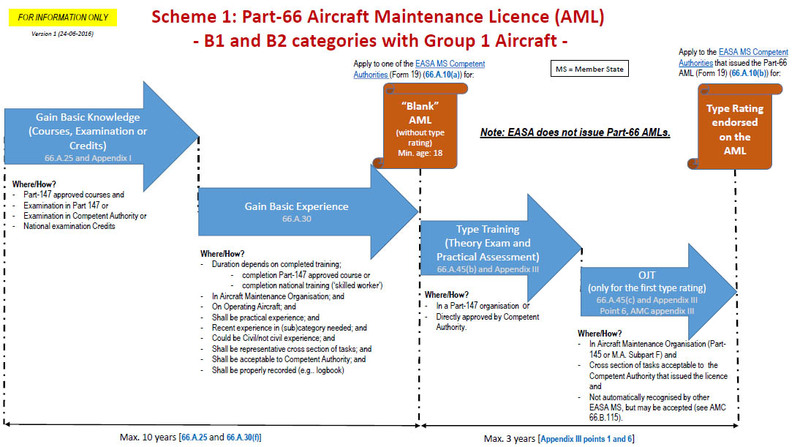 The holder of a category B2 aircraft maintenance licence may only exercise the certification privileges described in point 66.A.20(a)(3)(ii) of Annex III (Part-66) following the satisfactory completion of (i) the relevant category A aircraft task training and (ii) six months of documented practical experience covering the scope of the authorisation that will be issued. The task training shall include practical hands on training and theoretical training as appropriate for each task authorised. Satisfactory completion of training shall be demonstrated by an examination or by workplace assessment. Task training and examination/assessment shall be carried out by the maintenance organisation issuing the certifying staff authorisation. The practical experience shall be also obtained within such maintenance organisation. It should be demonstrated that the personnel carrying out pre-flight inspections have received appropriate training for the relevant pre-flight inspection tasks based on the operator’s CAME. All personnel involved in any maintenance, management and/or quality audits. Personnel who carry out and/or control a continued airworthiness non-destructive test of aircraft structures and/or components. 145.A.30(g) and (h) and associated AMC. Shall a Part-147 approved organisation have a mandatory occurrence reporting system according to (EU) No.376/2014? Article 4 of Regulation (EU) No. 376/2014 defines the persons and organisations obliged to report occurrences under the “mandatory reporting system”. Personnel working at/for organisations approved in accordance with EASA Part 147 are not listed in paragraph 6 of article 4, therefore such organisations are not required to implement mandatory/ voluntary reporting systems according to Regulation (EU) No. 376/2014. This does not prevent any organisation or person involved in aviation activities, including maintenance training activities, to report any safety occurrence or other safety information they consider relevant. Such reports would be to the voluntary reporting system to be established by all competent authorities according to Article 5.2 of Regulation (EU) No. 376/2014. Typically a Part- 147 approved training organisation having implemented an Safety Management System (SMS) on a voluntary basis would have such a voluntary occurrence reporting system. The European Commission (EC) published Guidance Material for Regulation EU No. 376/2014. Paragraph 3.3 further elaborates on the organisations affected by that regulation. An online service developed by the EC allows organisations and individuals to report aviation safety occurrences to aviation authorities. Courses outside the scope of Part-66 cannot be part of the Approval Schedule of the approved Part-147 organisation. This does not prevent a training organisation to provide such courses. The scope, content and the delivery methods of these courses will not be reviewed by the Agency or the EASA Member States, as part of the audit scope of the Part-147 organisation. However, when Part-M or Part-145 requires the staff to be trained, the appropriateness of such training being delivered would be assessed during the audits of these particular organisations. How can I become an EASA aircraft maintenance instructor? Part-147, in particular, 147.A.105 (f), state that the experience and qualifications of instructors, knowledge examiners and practical assessors shall be established in accordance with criteria published or in accordance with a procedure and to a standard agreed by the competent authority. There are no additional requirements or guidance published in EASA rules regarding the experience and qualification of instructors, except that it is recommended that potential instructors be trained in instructional techniques. The eligibility of candidates to a permanent or temporary (contracted independent) instructor’s position must be assessed in regards to the minimum qualifications defined by the concerned Approved Part 147 Training Organisation. The Organisation’s procedures should detail these minimum qualifications and associated eligibility criteria in terms of technical knowledge, pedagogical and instructional skills and working experience. EASA does not issue Instructor licences or equivalent, and permanent or contracted instructors can only exercise instruction privileges through the approval of a Training Organisation. Instructors are nominated by the approved organisation, which keep detailed records of their qualifications and are audited by the authority. Their authorised scope of activity is then stated on Terms of Reference provided to the instructors, as well as on the instructor/ examiners/ assessors approved list. For any further questions, we advise you to contact the training organisation Quality Assurance Dept. and/ or the Competent Authority (the one who granted the approval), in order to enquire about the possibility to be nominated as an instructor. Should the Part-147 organisation’s quality system be audited? a feedback system of audit findings to the person(s) and ultimately to the accountable manager referred to in 147.A.105(a) to ensure, as necessary, corrective action. This means that the quality system itself should be independently audited. The competent authority cannot perform this function on behalf of the organisation. The right level of the auditor(s)’ position within the organisation shall be met in order to assure the objective of 147.A.130 (b)2. (e.g. conflict of hierarchy, which could hinder an efficient and transparent report to the accountable manager). In addition, the audit programme/plan needs to reflect this regulatory aspect. The EASA Flight Standard Directorate consistently applies that policy during their standardisation visits. Is it possible to grant a Part-147 approval to a training organisation which intend to conduct only training on one or only several modules? 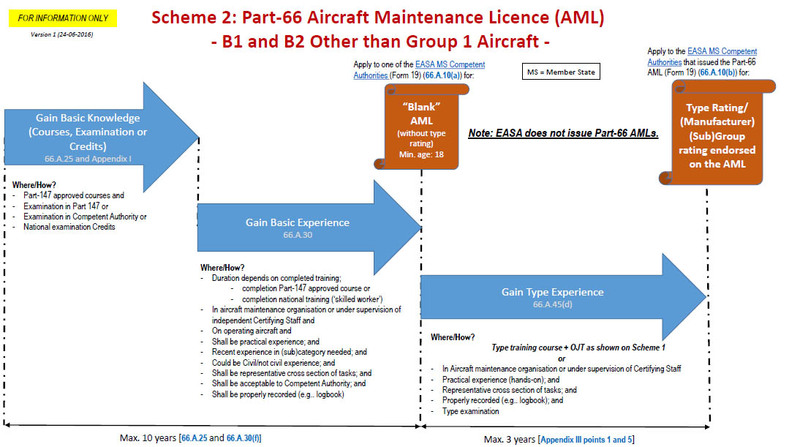 No, a Part-147 approval can only be granted to an organisation which plans to conduct training on all the modules related to a (sub)category of an aircraft maintenance licence, so that a full understanding of the training needs, interfaces and examination relative to that (sub)category of licence is achieved. However, some modules may be sub-contracted as mentioned in 147.A.145(d). It does not mean that the Part-147 organisation is not allowed to conduct courses on just one module. In particular, in the case of limitations resulting from the conversion process, limitations can be lifted through the teaching and/or examination of one module or a part of a module. I have completed a part of my basic training course (including some module examinations) in an approved Part-147 organisation. I’m moving to another country and would like to continue my basic training in a Part-147 organisation located in the country where I move in. Is this possible? What will happen with my certificates? Can I get the maximum reduction of the experience required for the Part-66 licence? Case No 1 (baseline – standard case) : The applicant completes the whole basic knowledge course (including the training, practical assessments and basic modules examinations) in an approved Part-147 maintenance training organisation. Result: The Certificate of Recognition (CoR) of the basic course completion is issued by the organisation. The applicant can apply for the Part-66 licence with 2 years of maintenance experience. Case No 2: The applicant completes the basic training in two different Part-147 AMTO (including the examinations). Result: The CoRs for the successful examination of each individual module are issued (by different AMTO), but not the CoR for the basic course completion. The applicant does not benefit from the experience reduction and have to fulfil the requirement of 3 years of experience (if recognised as skilled worker) or 5 years. there was a right proportion of theoretical and practical training for each subject. As this demonstration requires a significant investment, the applicant is invited to directly contact the competent responsible for performing such an investigation. Case No 3: The applicant has completed a full basic training course in one approved Part-147 organisation. Unfortunately, the candidate was not in a position to successfully pass the full examination process (all modules) in that organisation and had to pass the missing portion of the examination in another approved Part-147 organisation. Result: In this case the applicant would receive a CoR for basic training only as well as the CoRs related to the modules successfully passed in that approved Part-147 organisation. The examination for the missing modules may be successfully passed in another approved Part-147 organisation(s) with issuance of the related CoRs thereof. The combination of all these CoRs may be sufficient for the competent authority to recognise the training course as successfully “completed” and to grant the maximum credit for the experience (only 2 years needed) for the issue of the license. Case No 4: The applicant did not attend a Part-147 basic training course but only took examinations in one or more approved Part-147 organisation(s). Result: The applicant would receive several CoRs for the successful examination of individual modules from one or more approved Part-147 organisations. No credit of experience as per 66.A.30 will be granted (except for skill workers – 3 years). Standard 5 years of experience will be required. Further information is given in AMC to Appendix III to Part-147 “Certificates of Recognition referred to in Annex IV (Part-147) – EASA Forms 148 and 149. Is it possible to grant a Part-147 approval to a training organisation which intend to conduct only basic knowledge examinations? No, a Part-147 approval can only be granted to an organisation which can prove its capability to conduct training and examinations on a complete syllabus of at least one (sub)category of the Part-66 licence. Only in the case the organisation holds the approval for the complete basic training course, it may conduct basic examinations not being an integral part of the approved basic training course. Is it possible to grant a Part-147 approval to an organisation applying only for basic knowledge training? Yes, in such case Form 148 shall be used as template for the Certificate of Recognition, which specifies “Basic training course” or “Basic examination”. In the particular case where all modules are not conducted, (see next questions) the certificate shall state only “Basic examination” and the modules conducted be mentioned on the certificate including the date(s) of the examination(s). Part-147 approved organisations have the privilege to carry out basic examinations on behalf of the competent authority. Does this imply that the said authority has to supply or approve examination questions? No, the competent authority does not have to supply examination questions. However, as part of the oversight, the authority must sample check and review the organisations' question data bank and the examination process. Is it possible to perform aircraft type training in two different organisations? Can I do my practical portion of the type training in a Part-145 organisation? Only a Part-147 organisation has the privilege (if approved by its competent authority) to provide aircraft type training courses. This comprises both the theoretical and practical element of the aircraft type training, including the related examinations and assessments. This means that the practical element of the aircraft type training shall be completed in a Part-147 organisation. However, the aircraft type training may be conducted physically in a Part-145 organisation under the control (and as a part of the approval) of a Part-147 organisation issuing the Certificate of Recognition. It is not the privilege of the Part-145 organisation to conduct aircraft type training courses on its own. In addition, the theoretical and practical element of the aircraft type training can be conducted by two different approved Part-147 organisations. The competent authority endorsing the type rating on the license should be convinced that the interfaces have been correctly addressed before proceeding thereof (66.B.115(b) refers). In the special case where the aircraft type course is directly approved by the competent authority in accordance with the procedure 66.B.130 (i.e. only on a case by case basis – special authorization not granted for long term periods), the training can be conducted outside the scope of a Part-147 organisation. As a consequence, the certificate issued is not mutually recognized between Member States, which means it can only be used for aircraft type endorsement by the licensing authority who issued that direct approval. How should the 50% of tasks required for practical training be selected? Should it be 50% of tasks as per glossary (e.g. LOC, FOT, SGH, R/I, etc.)? The selection of 50% of tasks cannot be selected according to the glossary. Paragraph 3.2 of Appendix III to Part-66 clearly states that ‘the tasks selected shall be representative of the aircraft and systems both in complexity and diversity. In addition, the practical training should particularly address the tasks which cannot be explained by theoretical training only. While relatively simple tasks may be included, other more complex tasks shall also be incorporated and completed as appropriate to the aircraft type. Regarding the way to read the table in paragraph 3.2, the lines aims at covering the main systems so that no line relevant to the particular aircraft type should be omitted in the selection. Inside each line applicable to the aircraft type, half or more of the crosses can be selected. From a learning point of view, selecting 2 simple tasks as LOC and SGH would not be “representative”, while selecting LOC and TS, for example, would be much more appropriate. When selecting the tasks, the usage of filtering method based on the criteria similar to that described in AMC to paragraph 3.1(d) of Appendix III to Part-66, point 5 f) is recommended. What is the minimum duration of the practical element of the aircraft type training? The duration of the practical training should ensure that the content of training required by paragraph 3.2 of Appendix III to Part-66 is completed. However, for aeroplanes with a MTOM equal or above 30000 kg, AMC to paragraph 1(b) of Appendix III to Part-66 recommends the duration of the practical element of a type rating training course be not less than two weeks, unless a shorter duration meeting the objectives of the training and taking into account pedagogical aspects (maximum duration per day) is justified to the competent authority. This means that the duration of the a/c type practical training is not the main driver as justified by the status of that AMC. According to point 3.2 (b) Appendix III to Part-66 (having the status of requirement), the duration should be based on the content sufficiently representative in diversity and complexity in order to gain the needed competence. Can an examination be limited to some modules only, or one module only or part of a module only? As mentioned in the previous question, for some particular cases, the basic training need to be conducted and the relevant examination to be passed on some modules only or one module or part of a module (this is typically the case where the holder of a licence applies for removing some limitations mentioned in his/her licence). However, the Part-147 organisation should be capable of conducting the full course relative to the (sub)category sought, so that they can run the examination. Should examiners be specialists in the subjects, or can they be responsible for the proper conduct of the examination without being responsible for the content? “Examiner” should be here understood as “invigilator” (i.e. the personnel responsible for merely running the examination). The examiners (invigilators) are not required to be experts in the subjects examined when relative to the MCQs in accordance with Appendix II to Part-66. However, the assessment of essay questions as part of the basic knowledge has to be conducted by knowledgeable personnel with the help of a standard reply. Eventually, the invigilators must be trained to the examination process. Examiners should demonstrate a clear understanding of the examination standard required by Part-66 and have a responsible attitude to the conduct of examinations such that the highest integrity is ensured. (GM 147.A.105(g)). Regarding the type training examination and assessment standard as well as type examination standard as described in Part-66, Appendix III, paragraphs 4 and 5, the theoretical element examination can follow the same principle as above; however, for the practical element assessment, the examiner(s) must be appropriately qualified. Further provisions are available in Appendix III to AMC to Part-66. What is the maximum number of students attending the examination? Examination candidates shall be separated from each other so that they cannot read each other’s examination papers. (66.B.200(h)). Consequently, as long as the facility and examination standard as well as the integrity of the examination can be ensured, the number of candidates attending the examination may not be limited. In case of a larger number of candidates, two or more examiners may be used to ensure the integrity of the examination, such as separation of the candidates, no potential cheating, no speaking to each other, only examination paper on the table, no examination paper removed from the room, etc.